POT Camp starts October 3 « Pedagogy First! The Program for Online Teaching presents our professional development camp running six weeks starting October 3, celebrating the joy of teaching online. Each week we’ll explore a topic through reading, take a short quiz, discuss an issue, and create something cool. 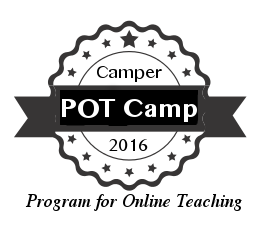 The theme for our 2016 Camp is The Context of Online Teaching: Education and Technology. All faculty who teach online, or want to teach online, are welcome to join! We’ll be camping out in our Canvas tent. Self-enroll at https://canvas.instructure.com/enroll/APJCWL. For more information, contact one of our camp counselors: Lisa M Lane, Jim Sullivan, Laura Paciorek, or Joanne Carrubba. Can you reset my password so I can enroll for this course?